International Journal of Research in Health Sciences,2014,2,1,363-365. 1-Senior Resident. 2-Professor. 3,4-Asst. Professor. 5-Post Graduate Trainee, Department of Surgery, RIMS. Imphal, Manipur, INDIA. A 70yrs old chronic smoker male farmer presented with multiple skin nodules which on FNAC and biopsy turned out to be well differentiated squamous cell carcinoma. In view of its multiplicity it was considered as a case of skin metastases and a primary source was searched. Chest X-Ray and CECT Thorax showed the primary lesion as carcinoma of lung. Skin metastasis as the first sign of internal visceral malignancy occurs in around 0.7 to 10.4% and 1 to 12% of lung cancer has skin metastases. Skin metastases usually indicate a poor prognosis. The case is being presented in order to make aware of the rare and deceiving ways of presentation of internal malignancies. 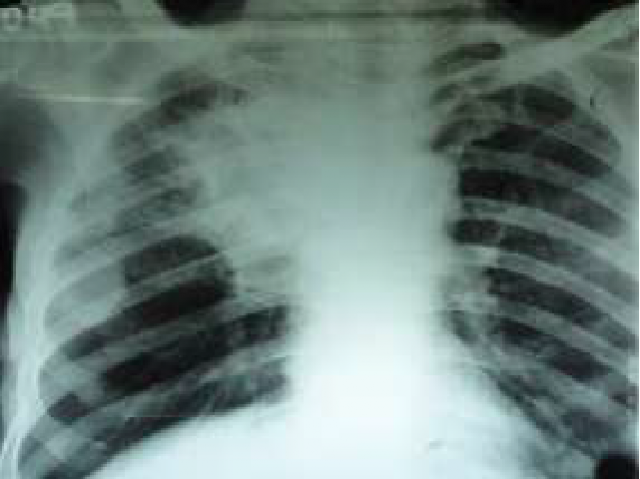 Chest X Ray of the patient showing mass lesion at the right lung.